May | 2014 | OccasionalPiece--Quilt! 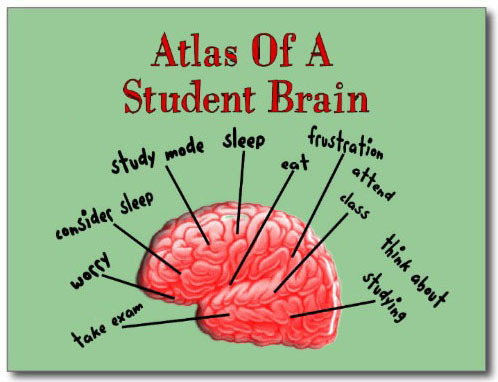 Posted on May 27, 2014 by Elizabeth E.
Inspired (always) by Mary, who blogs at Molly Flanders Makerie, I have had circles on the brain for several months now, hiding behind that other stack of things I’m always yakking about. 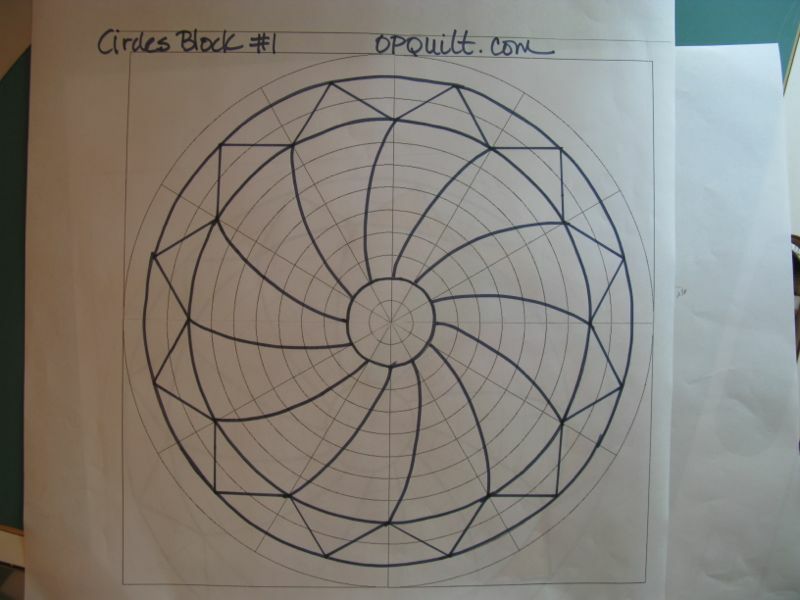 I searched through Barbara Brackman’s Encyclopedia of quilt blocks and found quite a few circle blocks that interested me. I have missed having a handwork project to keep myself busy while I watch movies or chat, so wanted to get one together before I start some of my summer travels. Notice that the 12″ line is the NOT the outside line, but just inside. I did it that way to allow for seam allowances, but please don’t let it confuse you. 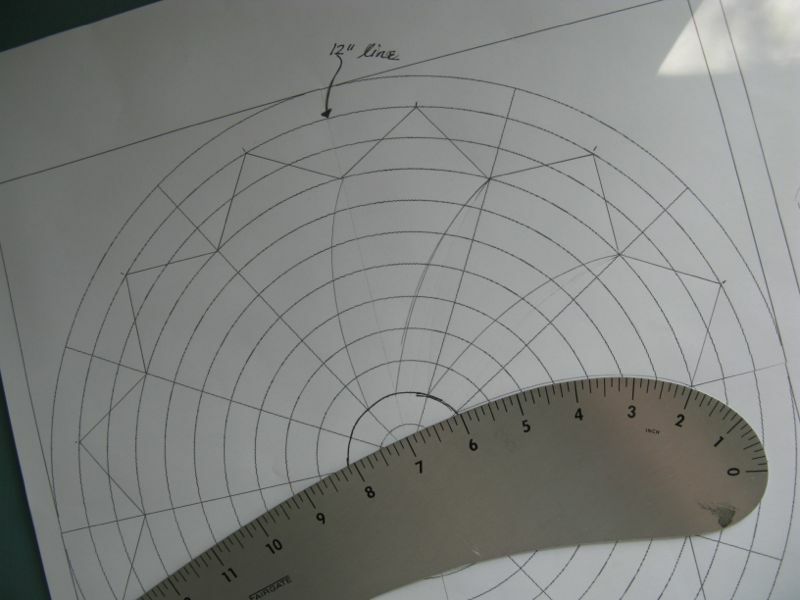 That curve ruler is leftover from my Clothing and Textiles college days, but you could use a large dinner plate, or other curved edge. I cut it apart into its pieces. 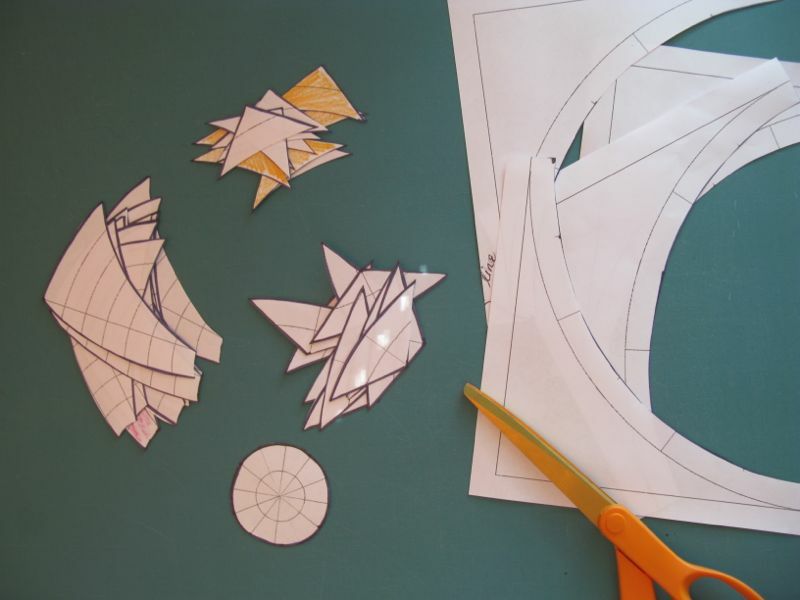 I don’t know if I’ll paper-piece those outside quarter-circles onto the circle block, or appliqué the circle to a big 12 1/2″ square piece of fabric. Stay tuned. 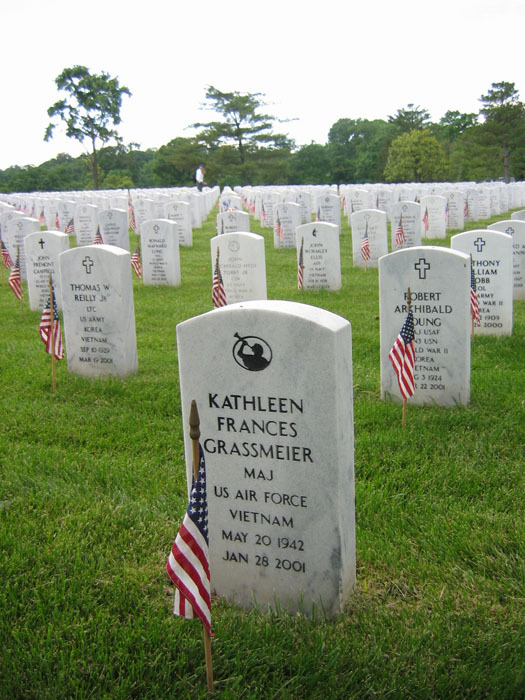 Posted on May 25, 2014 by Elizabeth E.
Arlington Cemetery, with all the flags out on Memorial Day. 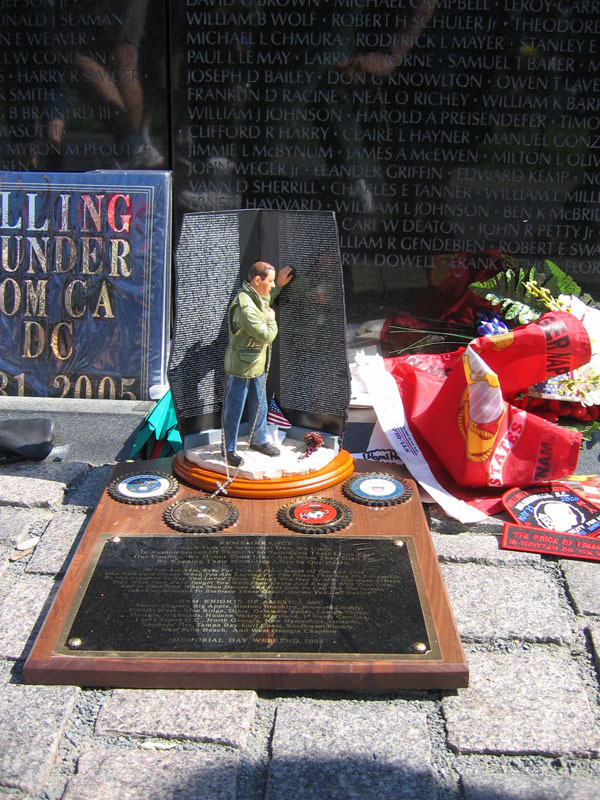 My husband and I were lucky enough to spend a year in Washington, DC, a formative experience, and that included Memorial Day Weekend, with the Rolling Thunder Ride. 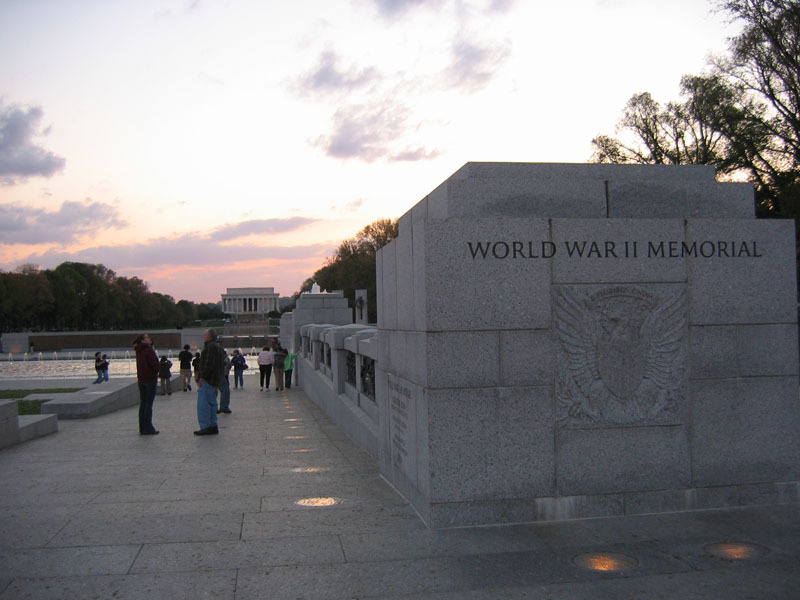 I think I spent most of the day in tears, as we began the day on the bridge leading to the Lincoln Memorial and waved on the riders for a long, long time. I also visited the Wall (as the Vietnam Memorial is called) and saw all the moments and ribbons and flowers and treasures left there. Each keepsake will be collected, categorized and saved. 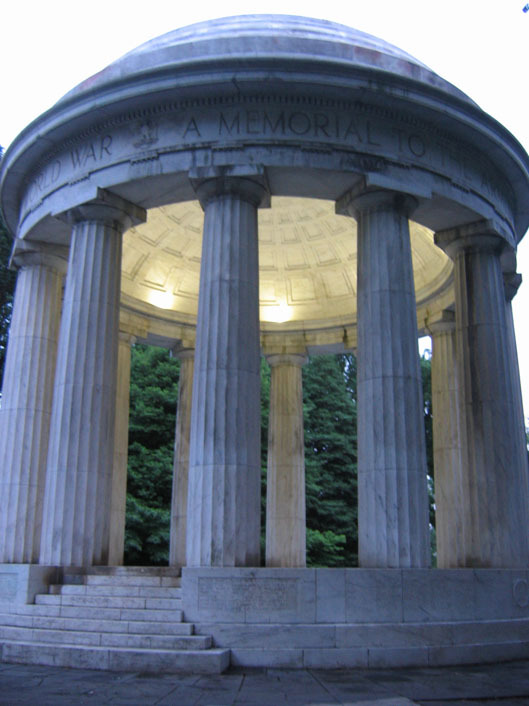 The honor given to those who laid in cemeteries, had names on the Wall, or seeing the aging veterans that flooded the city was intensely moving. Happy Memorial Day, to all of you. 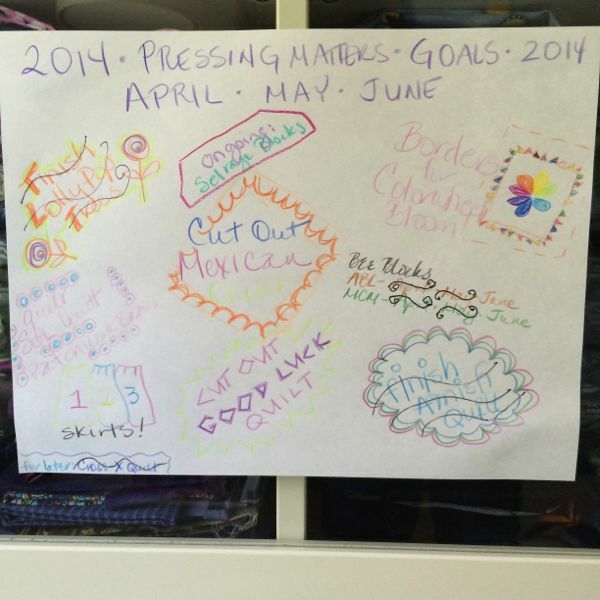 Posted on May 21, 2014 by Elizabeth E.
So I was pretty bummed about not being able to make up this into a larger quilt, or not being able to use it (see last post for explanation), but then VOILA! that old principle of the Universe Takes Away and the Universe Delivers came into play. Strolling through my Instagram feed I glimpsed this and made a screenshot, then headed to Sharon McConnell’s website: ColorGirl’s Fabrics & Flowers. There she not only has more instructions, but also a link to a free pattern on Craftsy. Very sweet. Now that I’m through with my semester, looks like a new project to add to my Summer To Do List. 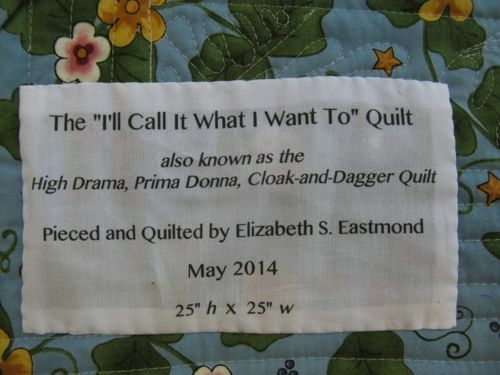 Posted on May 19, 2014 by Elizabeth E.
2–Famous Quilter then requests you name your full quilt after her block name, even though you have a tradition of naming your quilts after rhymes, famous and pithy quotes, and verses. You demure, saying you use Famous Fabric Designer’s Fabrics and they don’t insist the quilt be named after THEIR fabrics, but that you would be more than happy to include the name of Famous Quilter’s block on your label. 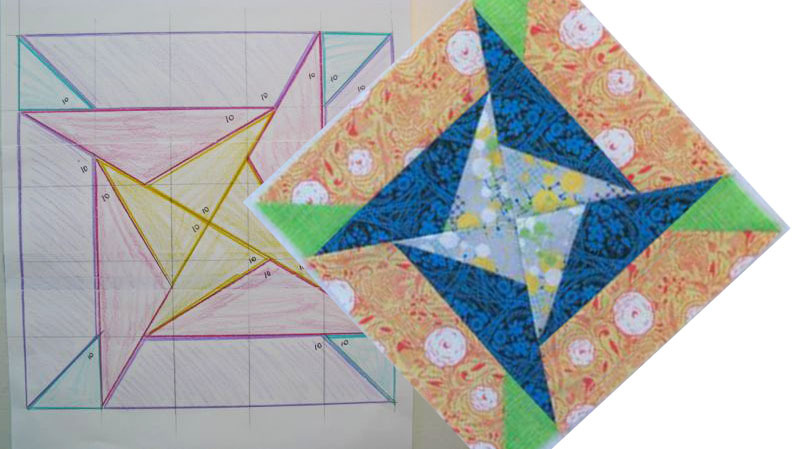 3–Famous Quilter writes back and insists, saying if I won’t name the whole quilt after her block name then I can’t use the name anywhere, nor can I teach a class from it, and implies that I can’t even write about it on my blog. 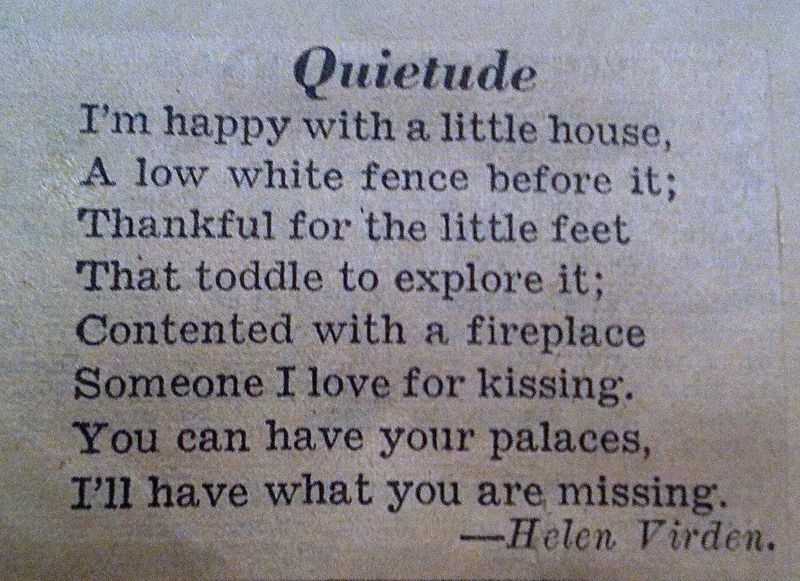 I can, however, call the quilt what I want to within the walls of my own home. 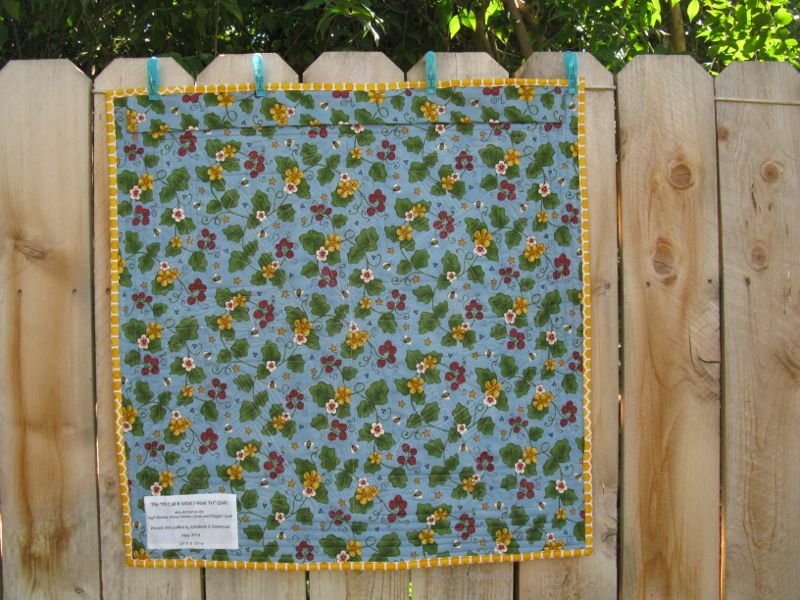 Is Famous Quilter within her rights to deny me naming rights to my own quilt? Notice the only time I would be making any money would be if I were to teach a class. 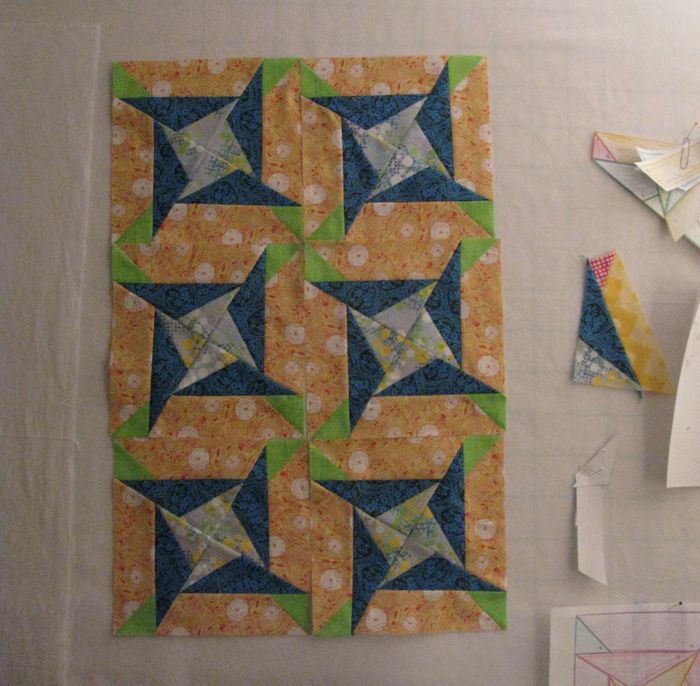 (Which I won’t be now, even though I wrote up the directions for this block, right after Famous Quilter gave me permission, before rescinding said permission.) Writing up the directions, buying and choosing the fabric for it, cutting it out, sewing it, quilting it, binding it would all be on my expense (not to mention the purchase of her out-of-print book). 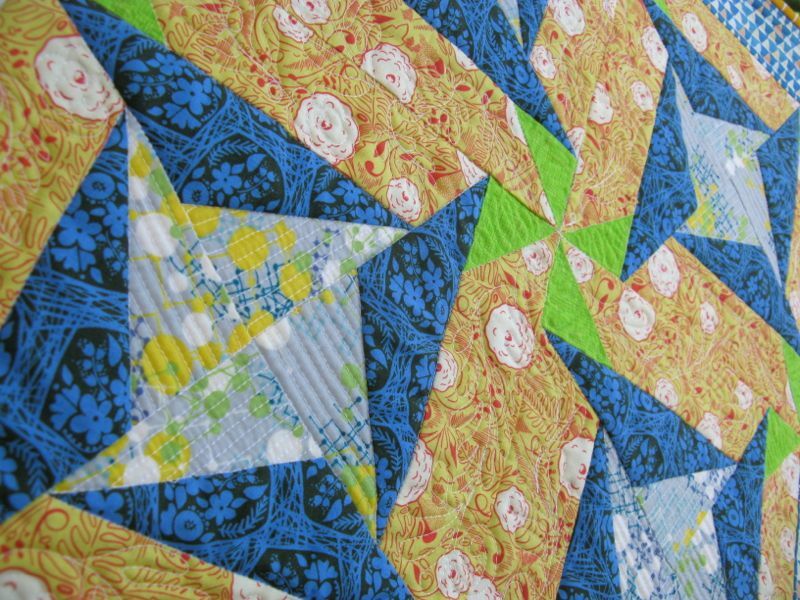 Has Famous Quilter fallen off her Famous Quilter’s Pedestal? 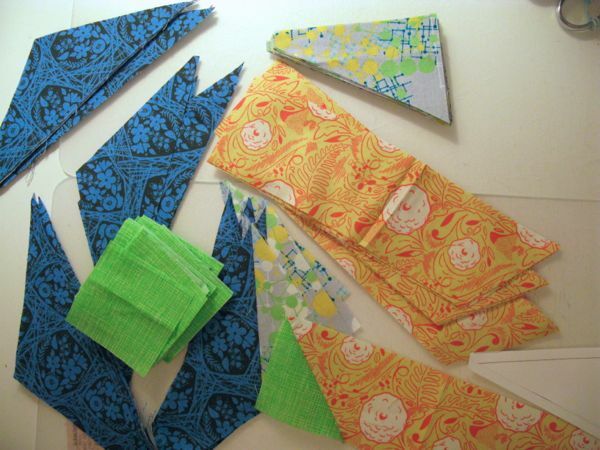 All the cut pieces for the making of a quilt which, according to her, I can only call it by it’s True Name in the confines of my own home? There is no such thing in US Copyright Law that gives a copyright owner the authority to impose restrictions upon the use of copyrighted material once it has been sold or given away by the copyright owner. They also linked to an Article on the “Hot topic among quilters: Copyright” about a quilter from Iowa who was suing another quilter for “stealing” one of her designs. 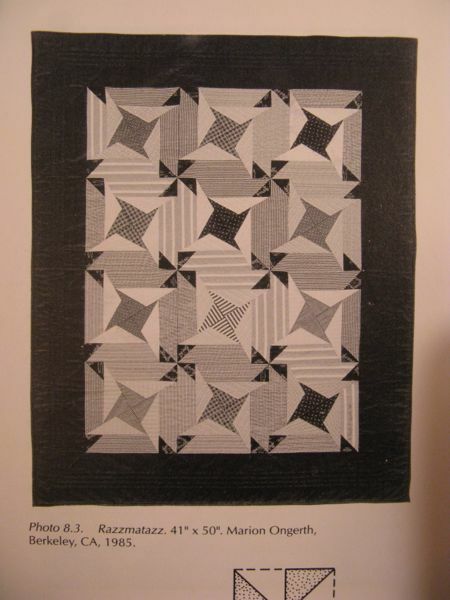 I truly believe Famous Quilter believes she is well within her legal rights to insist on my naming my quilt the name of her block, even though when I looked through her book, she had not followed the same naming protocols (which I pointed out to her most respectfully). 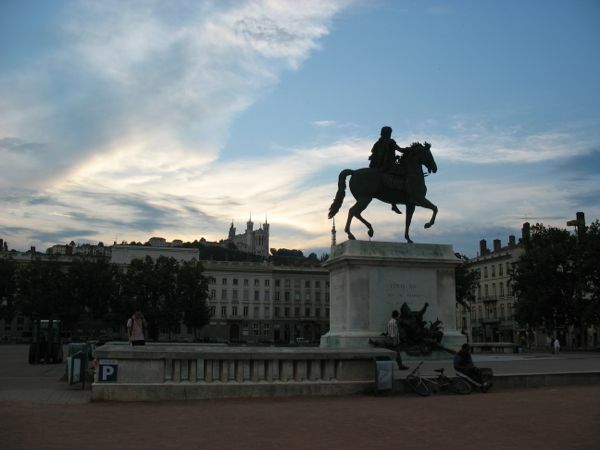 Some questions: Do copyright squabbles make us more strident in our need to claim our turf? Or is this typical of a small business, working hard to protect their product (regardless if I consider it moving past a reasonable boundary)? 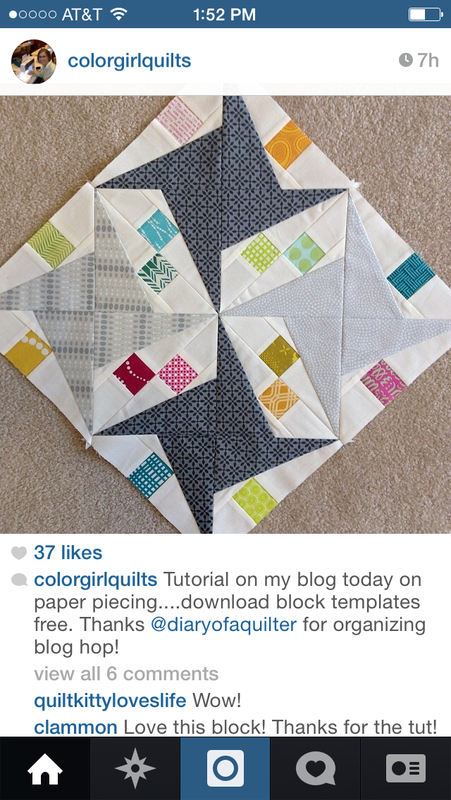 If you are a quilt designer, would you expect (insist) on the maker naming the quilt after your block? 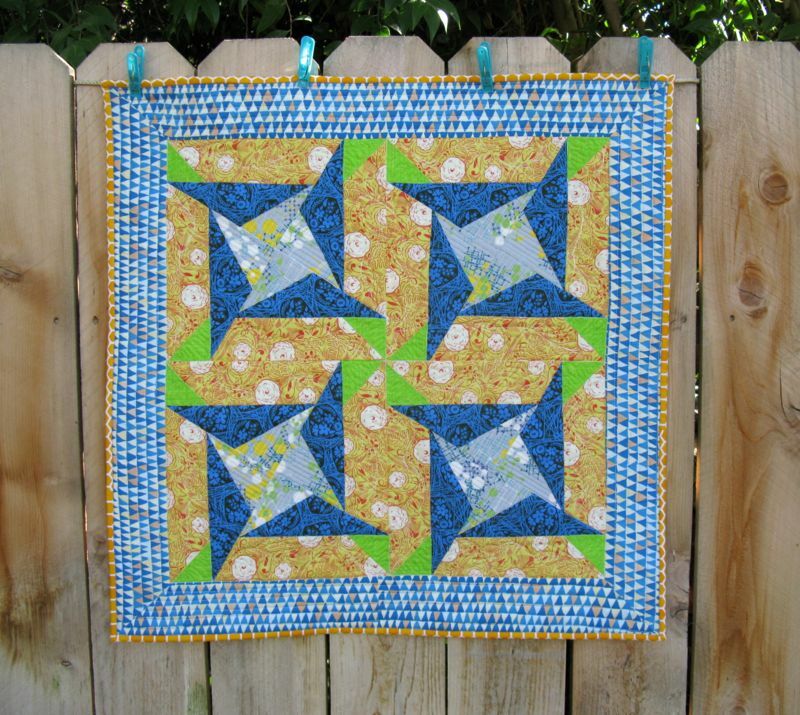 Final Thoughts: if you comment (and I hope you will, especially if you are a quilter in business) please resist dumping personally on the Famous Quilter, but you are welcome to give me your opinion of this mess I find myself in. 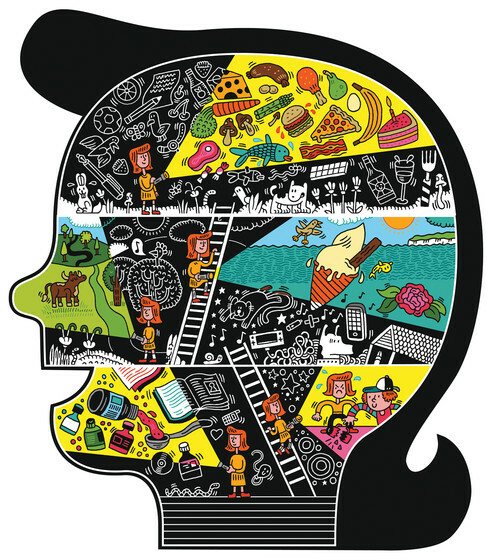 The more I read, the more I think Leah Day (and Austin Kleon) have it right: Attribution in our day and age is the grease that keeps the creative wheels turning. 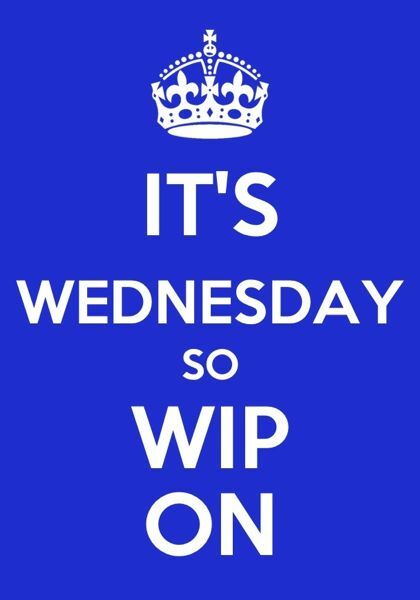 Posted on May 15, 2014 by Elizabeth E.
Cindy says I need to have Random Things on my Random Post. Okay, here goes. 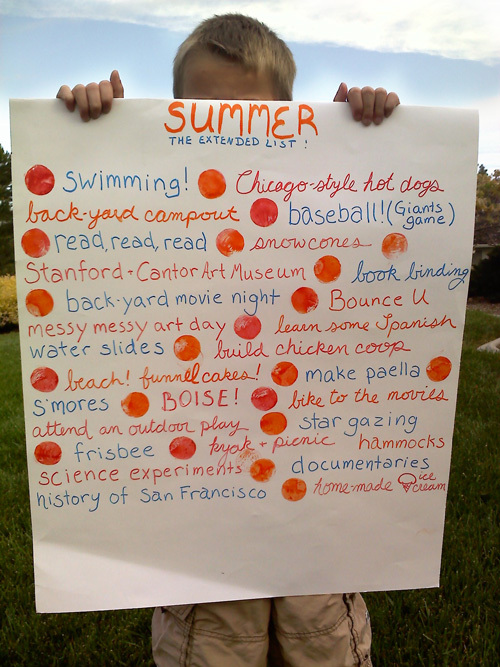 But this is Teacher Brain During Summer. It’s nice not to feel impacted all the time, as illustrated by this cartoon of Jef Mallett’s. I read Frazz every morning to get my day started. Yesterday I went up to school (I teach at a community college) and attended the Transfer Center’s luncheon honoring students who leave the confines of our 2-year college and head up to the Big U. 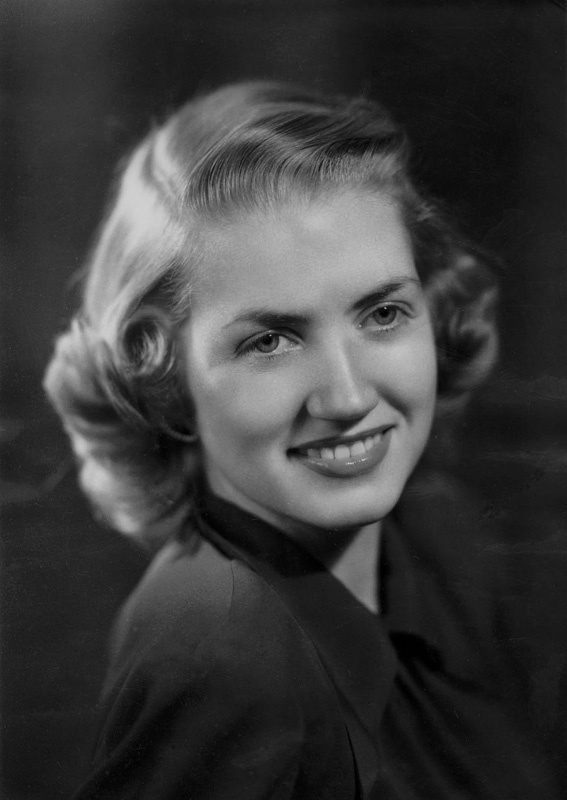 Today I’ll be attending a retirement luncheon for a woman who has really helped my non-native English speakers throughout my time here. That’s how it rolls at the end of the semester. 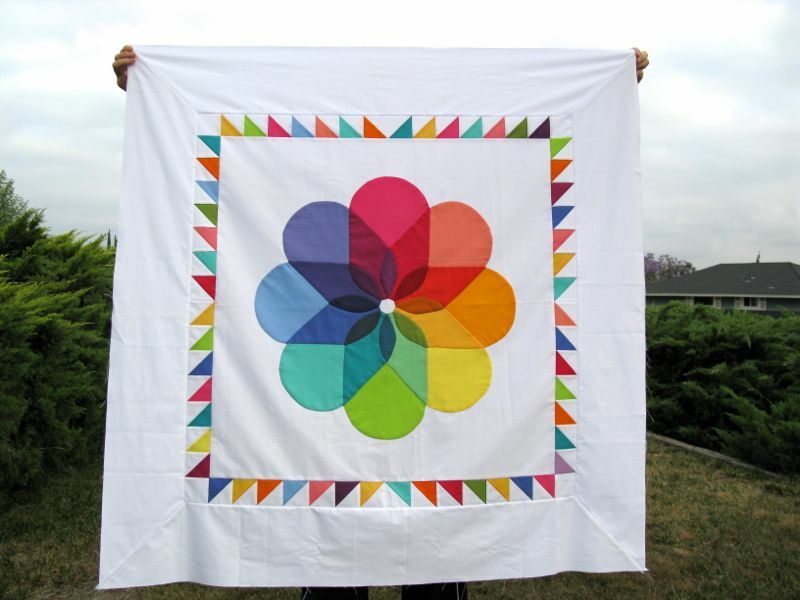 I started working on this quilt and got myself involved in a Whole Lotta’ Drama. Follow-up story coming Monday. 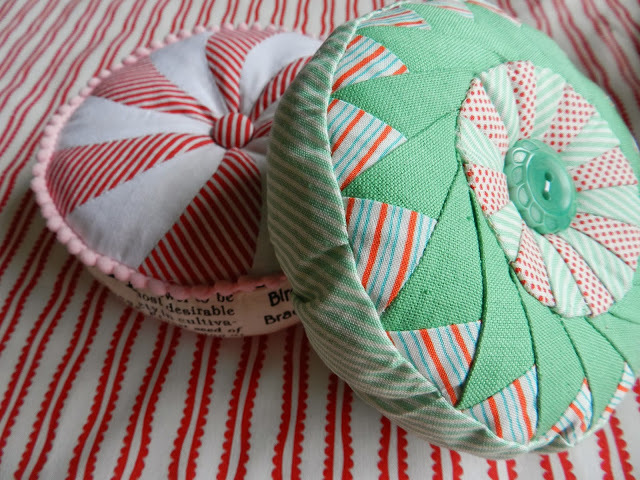 I’ve been listening to Life After Life while I sew. 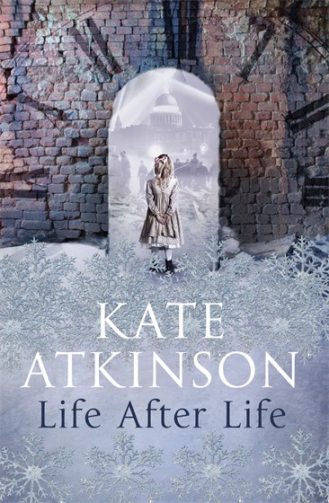 This is one interesting book, where the main character keeps dying and come back to life in her same life. I can hardly wait to get upstairs to the sewing room, pick up a project and start listening. 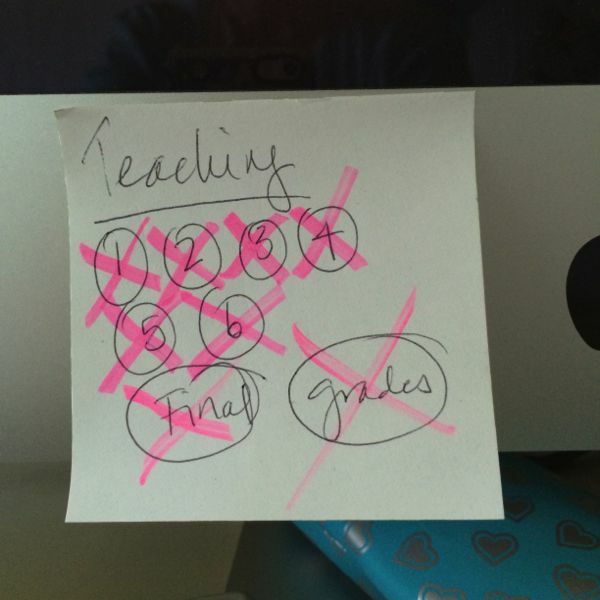 Coming to the end of the school year means taking a breath and doing the little things that you couldn’t get to because you were hurtling from one grading session to the next. 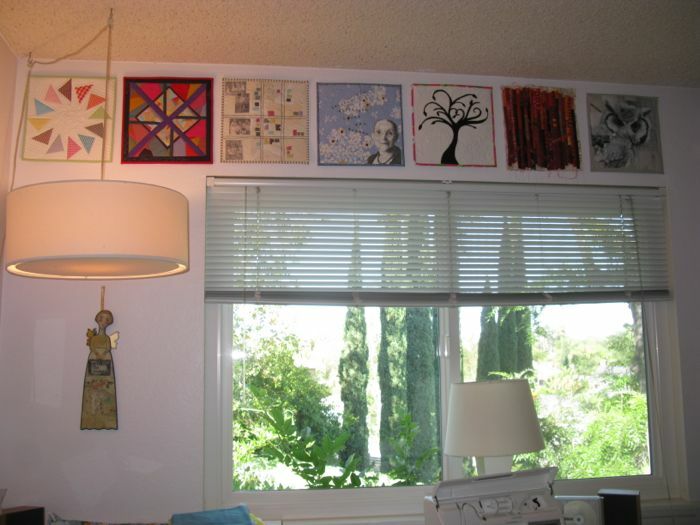 This morning my husband helped me hang all my little Art Quilts in a row over my sewing room window. 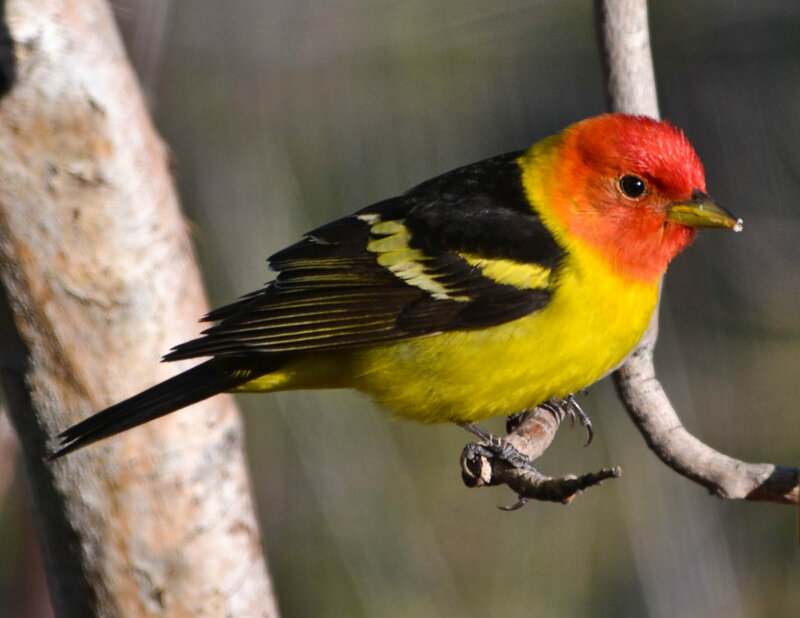 Outside my window the Carrotwood Tree is filled with flitting Western Tanagers, yellow with black wings and brilliant orange heads. They move quickly from branch to branch, eating the yellow berries from my tree. I’m not a bird photographer, so this photo is from *here. * They provide quite the show. 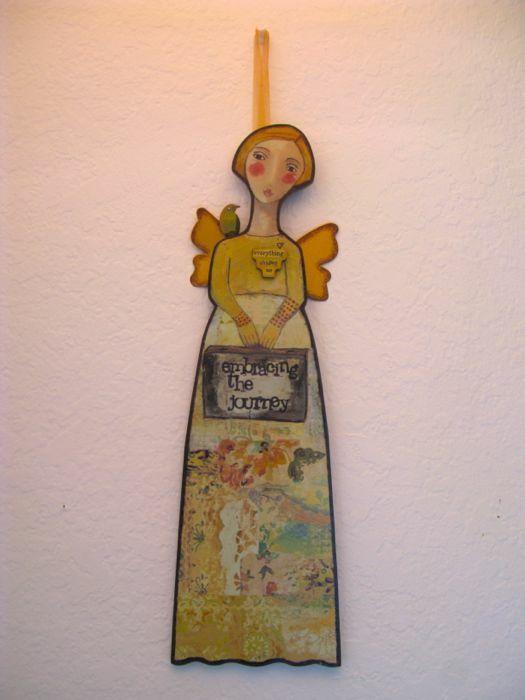 Detail of the woman over my sewing desk: Embracing the Journey. Today is the last day of class, and it’s been a nice journey but Now It’s Time to Go. 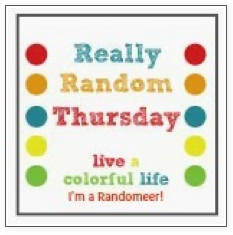 Linking up to Cindy’s Really Random Thursday at Live a Colorful Life!